Open to anyone of any age. Images may be submitted electronically online, on a CD/DVD, or flash drive. Use the entry form on page 2 when using a CD/DVD/flash drive. Each entrant may submit a total of eight (8) images. The entry fee is $3.00 per image for members of Nevada Camera Club and students. All others pay an entry fee of $5.00 per image (cash or check). The entry form, CD/DVD or flash drive, and entry fee must be submitted together. Entries will be accepted online starting May 1, 2019 down below. An additional $1.00 convenience fee for online payment will be charged. In addition to online, entries will be accepted on Friday, May 24, 2019 from 5:30 PM - 6:30 PM at the Sunrise Hospital Auditorium, 3186 S. Maryland Parkway, Las Vegas, Nevada 89109. The online entry portal will close at 6:30 PM, May 24. *NOTE: No specific category is defined by technique. Subject matter must be the defining parameter. Care must be taken in the Documentary, Nature, Photojournalism, Travel, and Wildlife categories. Normal photographic processes may be used to enhance the image quality in these five reality based categories but must not be used to alter the truth of the photographic statement. This means not altering the factual representation. Prints of the category winners and Best of Show images will be exhibited at the Whitney Library beginning July 11, 2019. Makers of the winning images will be contacted to provide a file of suitable size to be printed. The print will be given to the entrant after the exhibit. A multimedia presentation of all competition entries will be shown at 6:00PM on the opening day of the exhibit and awards will be presented. The exhibition and multimedia presentation are open to the public. The multimedia presentation of all competition entries may be shown during a regular meeting of Nevada Camera Club. First place, second place, third place and honorable mention winners in each category will receive ribbons. A Best of Show ribbon and a $100.00 cash prize will be awarded in each division (Monochromatic and Color). A Best of Category ribbon will be awarded for each category. Best of Show and Best of Category winners will receive a matted print of the image. Images will be judged by a panel of photographic judges. Judges have the right to re-categorize entries. The decision of the judges is final. Images that have won a first place ribbon in a previous Nevada Camera Club Annual Electronic Image or Annual Slide Competition are not eligible. Entries must have been photographed by the entrant. Images may be horizontal, vertical or square. Horizontal Image – The width must not exceed 1920 pixels. If the height exceeds 1200 pixels, the height should be resized to 1200 pixels or less and the width should be adjusted to maintain the original aspect ratio. Vertical Image – The height must not exceed 1200 pixels. Square Image – Width and height must not exceed 1200 pixels. Although there is no minimum size, it is to the advantage of each entrant to make the dimensions as large as possible without exceeding the maximum dimensions listed above. File format must be JPEG using .jpg as the file extension. Color depth must not exceed 24 bits per pixel. If not entering online, copy all entry image files to a single CD/DVD or flash drive and mark (label) it with your name and phone number. Files should be named using the category, division, and image title (EX. : PJC-FreedomsHeroes.jpg for an entry in Color Photojournalism entitled “Freedom’s Heroes.”) The CD/DVDs will not be returned. Flash drives will be returned at the October 12 program meeting. The entries need to comply with the above requirements to be projected, both for the judges and for the multimedia presentation. If an image is not in JPEG format,or if an image exceeds 1920 pixels in width or 1200 pixels in height it will be disqualified and will not be judged. There will be no refund for disqualified images. The entrant grants to the Nevada Camera Club the right to display submitted images during the reception multimedia presentation and at a regularly scheduled Nevada Camera Club meeting. The entrant also grants to the Nevada Camera Club the right to make one print of each category first place winning image and display said print during the gallery exhibition period. The print will be given to the entrant after the close of the exhibition. All other rights remain with the entrant. Matted prints of the winning first place images will be available for pick up at NCC General Meeting on September 27, 2019. 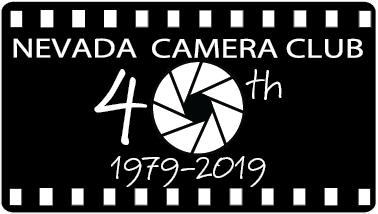 For meeting time and location, please see the Nevada Camera Club web site at http://nevadacc.org/ or call 866-925-1447. All possible care will be taken with prints. However, the Nevada Camera Club will not be responsible for lost or damaged items. For assistance Special Competitions Chairperson, by email or leave a message at 1-866-925-1447.